Eleven US, NATO, and Afghan troops and an interpreter were killed in a helicopter crash in southern Afghanistan today. The Taliban have claimed credit for shooting down the helicopter, although the cause of the crash has not yet been determined. The Taliban claimed they shot down a helicopter in Zirtali in the Shah Wali Kot district in Kandahar province in a statement released on their website, Voice of Jihad, late Wednesday night, before ISAF confirmed the crash. The spokesman for Kandahar’s provincial government confirmed that a helicopter was shot down in the province, according to Khaama Press. 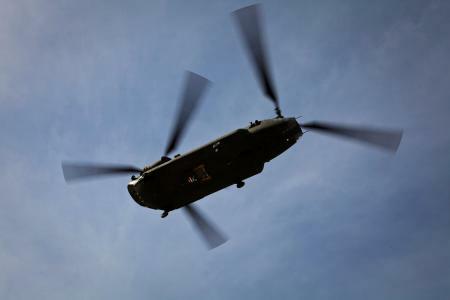 The Taliban said they shot down the Chinook with a rocket-propelled grenade, or RPG, while the ISAF and Afghan forces were conducting a raid. The Taliban claimed the helicopter “was set ablaze in the air and fell to the ground,” and that 33 troops were killed. The Taliban routinely exaggerate the casualties caused by their attacks. Although not stated by ISAF, the helicopter may have been used for a joint Coalition and Afghan special operations raid. US Forces-Afghanistan personnel include US special operations forces troops, and are used to conduct the targeted “night raids” against key nodes of the Taliban, Haqqani Network, al Qaeda, the Islamic Movement of Uzbekistan, and other allied terror groups operating throughout Afghanistan. Additionally, the composition of the forces – US and Afghan – conducting a raid at night in an area known to serve as a Taliban haven, indicates this may have been a combined special operations raid. The Taliban have shot down special operations forces helicopters in the past using RPGs. The two largest shootdowns resulted in the deaths of dozens of US special forces and Afghan troops. On Aug. 6, 2011, the Taliban shot down a US Army Chinook helicopter in Sayyidabad. Thirty-eight US and Afghan troops, including 17 US Navy SEALS from the Naval Special Warfare Development Group, were killed in the crash. In July 2005, the Bara bin Malek Front, a Taliban subgroup operating in Kunar, shot down a US special operations Chinook helicopter. The US team was attempting to recover a four-man team of Navy SEALs who disappeared during Operation Red Wings. Three of the missing SEAL team died in an ambush and another 16 US personnel — eight SEALs and eight members of the 160th Special Operations Aviation Regiment — were killed when the Taliban shot the helicopter down with a salvo of rocket-propelled grenades.